It is true that we are far too stingy when it comes to doling out grace to others and far too generous in serving ourselves. That’s because our faults are understandable. Indeed, we understand them well. It’s the faults of others that are truly incomprehensible. And we would straighten them out were they not so crooked that they would never listen to us. This is the problem that C.S. 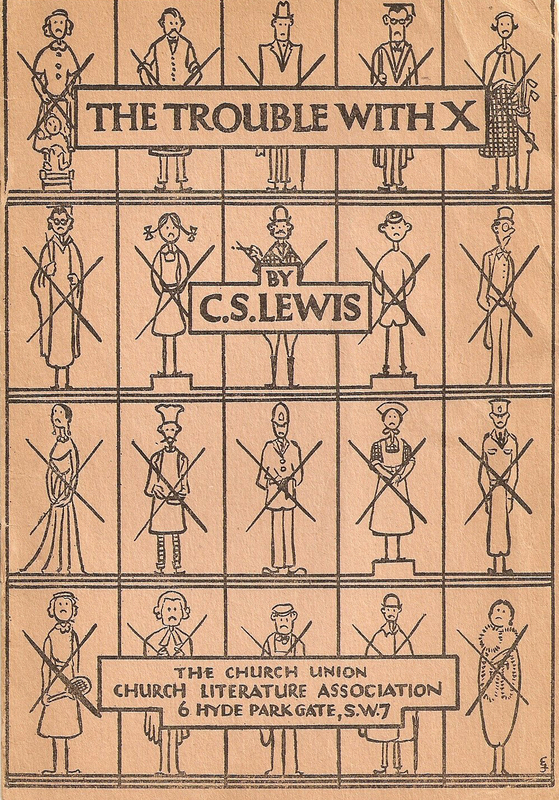 Lewis tackles in his essay “The Trouble with X.” The cover of the little pamphlet is informative with its collage of characters all exed out. The real problem for our lack of happiness is, we think, as Lewis demonstrates, other people. This is, of course, patently false. The real issue is that we are X. We are the ones with the real problem, at least the only real ones upon which we can, or should, devote our energy and attention. This is not to say there are not specific issues which require our examination of others. But Lewis is showing us that we take what should be the exception and make it the rule. We may make criticism our pet privilege today, but tomorrow it will become our master. It will soon outgrow the arbitrary leash we place upon it. That’s because as long as we think the real problem is outside of us, we will spend all of our energy fixing others—or at least talking about how they need to be fixed—instead of ever looking within where our deepest problems reside. Let us remove the beam before we work on the speck (Matthew 7:5). Let us turn our attention to where it is needed most. “The matter is serious,” Lewis reminds us, “let us put ourselves in His hands at once—this very day, this hour.” Amen.